These algebra lessons introduce the technique of solving systems of equations by substitution. 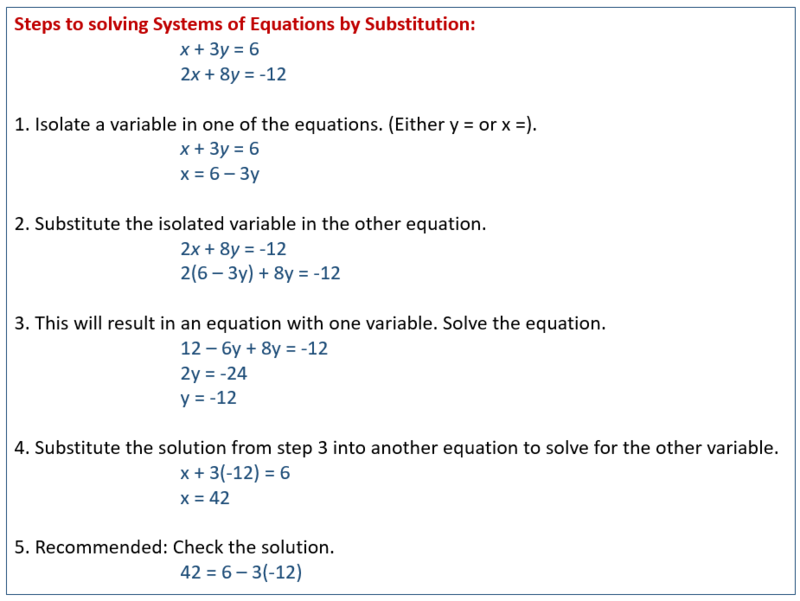 The following example show the steps to solve a system of equations using the substitution method. Scroll down the page for more examples and solutions. In the Substitution Method, we isolate one of the variables in one of the equations and substitute the results in the other equation. We usually try to choose the equation where the coefficient of a variable is 1 and isolate that variable. This is to avoid dealing with fractions whenever possible. If none of the variables has a coefficient of 1 then you may want to consider the Addition Method or Elimination Method. 1. Isolate a variable in one of the equations. (Either y = or x =). 2. Substitute the isolated variable in the other equation. 3. This will result in an equation with one variable. Solve the equation. 4. Substitute the solution from step 3 into another equation to solve for the other variable. 5. Recommended: Check the solution. Step 1: Try to choose the equation where the coefficient of a variable is 1. Example of a system of equations that is solved using the substitution method. Example of how to solve a system of linear equation using the substitution method.